The second book in Rae Carson's award-winning The Girl of Fire and Thorns fantasy trilogy, perfect for fans of Game of Thrones and Kristin Cashore. Tamora Pierce called the first book, The Girl of Fire and Thorns, "A unique and engrossing read!" A seventeen-year-old princess turned war queen faces sorcery, adventure, untold power, and romance as she fulfills her epic destiny. In The Girl of Fire and Thorns, Elisa won the war. She saved her kingdom. But no one prepared her for how hard it is to recover from a battle, or to rule a people who still don't trust her. She's still fighting—against assassination attempts and more—and her enemies lie both outside her court and within it. So Elisa will cross the ocean in search of the perilous, uncharted, and mythical source of the Godstone's power. With her go a one-eyed warrior, a loyal friend, an enemy defector, and the man she is falling in love with. A breathtaking, romantic, and dangerous second volume to Rae Carson's ambitious trilogy. Cinda Williams Chima proclaimed about the first book, The Girl of Fire and Thorns, "I LOVED this book!" and Veronica Roth agreed, saying, "Definitely recommended." YOU GUYS! It is like I keep on regressing with my procrastination – getting worse and worse and worse. BUT OKAY I MET SOME COWORKERS FOR CELEBRATION ADULT DRINKS. Just one – and some water. 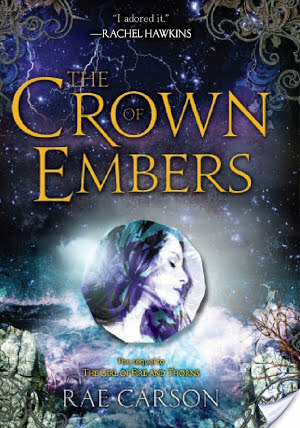 But now I am home and ready to tell you all about the things that happen during these chapters of The Crown Of Embers. First off, we are still ON A BOAT. Word. AND OMG we get to meet Hector’s brother. Elisa ponders why Hector wants her to dismiss him from service – um, because he loves you duh. AND FINALLY REALIZES IT. But because this is YA, there are things that come between them.Only, ugh, Hector is still on about marrying Alodia. PLEASE JUST STOP WITH OUR HEARTS. Then! The boat is in trouble but Elisa maintains her faith and there is TENSION and praying. And there’s like this tornado. And Elisa passes out. Then she wakes up and whoa, everyone is alive. Mara is hurt and Elisa figures out the trick to healing her because Elisa is awesome. There I said it. She is awesome. THEN THERE IS SOME KISSING JUST AROUND THE CORNER, keep turning pages you guys it is SO amaze. It has made me lose my ability to even. What is air, y’all. Then, they find the zafira – the gate and realize, okay this is awesome power but it comes with a major price. To Elisa, the price is just not worth it and her heart is telling her she doesn’t quite need the zafira. Then some more things happen and Hector is all emo. Then he gets kidnapped. The end. AND ONTO THE SEQUEL. By the way — when you guys are reading this next week I will be in Orlando at Disney World. Cheers to vacation and Labor Day! I write books about teens who must do brave things. I’m originally from California, but I now live in Arizona with my husband, who is the smartest and therefore sexiest man I know. My books tend to contain lots of adventure, a little magic and romance, and smart girls who make (mostly) smart choices. I especially love to write about questions I don’t know the answers to.